C.1905, Ansonia, Royal Bonn, La Claire, in generally good original condition, except for a small stress crack on rear leg, and a small piece out of the left front toe. 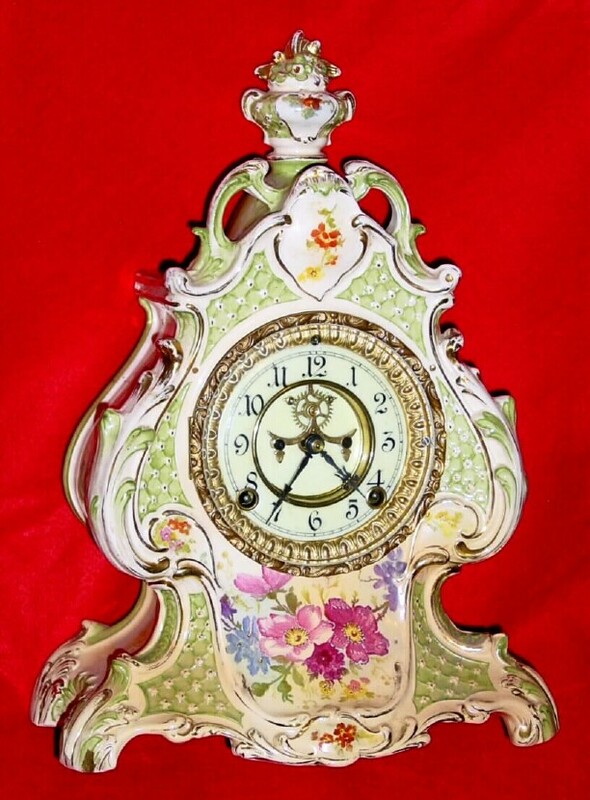 This is an uncommon model and with pleasant cream colored base with lime green and gold accents. There is a slight discoloration under the dial from over-oiling the movement. Retains excellent porcelain dial with NO chips nor cracks and with open escapement. For reference, see Ly\'s Ansonia book, page 637; we sold the last of these with a repaired top for $1900+, lot 442, April 2001. Note height 15"